Take tomatoes, bottle gourd, carrots, beetroot and crush it in the mixture. 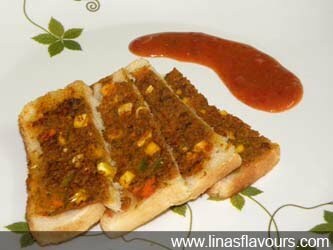 Take a pan, add capsicum, corn kernels, vegetable mixture and cook it for about 1-2 minutes. Add red chilly powder, turmeric powder, salt, garam masala, besan and cook it for 2-3 minutes till the mixture thickens. If it is still watery then add some more besan. Switch off the heat. Take bread slices. Apply the mixture on one side of the bread slice. Like this apply mixture on all the slices. Take non-stick tawa, add ghee/butter and toast it till its light brown on low flame otherwise it will burn from top and will remain half cooked from within. Cut into half and serve it hot with tomato ketchup. You can be creative in choosing vegetables and have your choice of vegetable mixture.